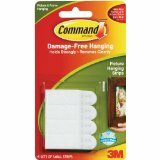 Ideal for organising and decorating any home or office environment. 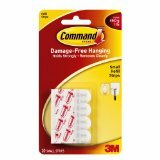 8 small, 4 large, and 4 medium strips per pack. 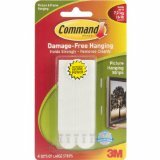 For mounting items or for reusing with 3M hooks and picture hangers. 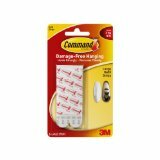 3M wall mounting products remove cleanly and may be moved and reused repeatedly. 8 small, 4 large, and 4 medium strips per pack. 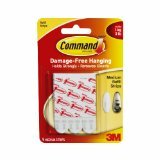 Command products offer simple, damage-free hanging solutions for many projects in your home and office. 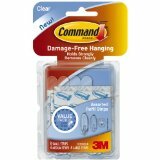 Simplify decorating, organizing, and celebrating with an array of general and decorative hooks, picture and frame hangers, organization products, and more. 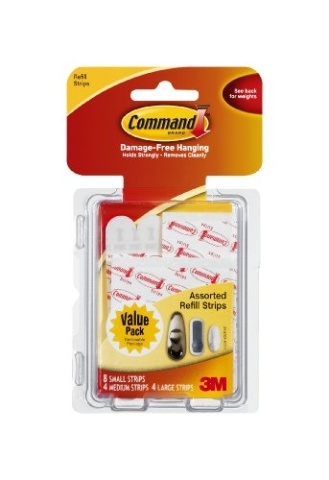 Thanks to the innovative Command Adhesive strips, you can mount and remount the your Command products without damaging your walls--no nails, tacks, or tape required. 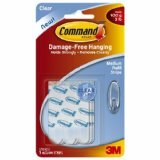 Ideal for multiple uses, these Command refill strips allow you to rearrange without a fuss. Display photos or artwork in your living room, pictures or favorite memorabilia in your dorm room, and personalize your office by hanging your diploma or awards. 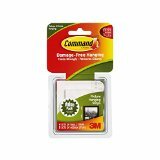 You can easily remove these Command products without damaging the walls, so you're free to experiment with new decorating ideas and change your environment as often as you please. 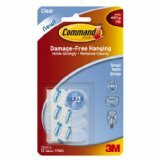 Applying Command products to just about any flat, clean surface is as easy as 1, 2, 3. Allow the adhesive strip an hour to set after application, and you'll be ready to hang all your cords. 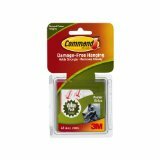 An ideal alternative to nails, tacks, or tape, Command Adhesive holds strong, yet leaves no sticky residue or stains.